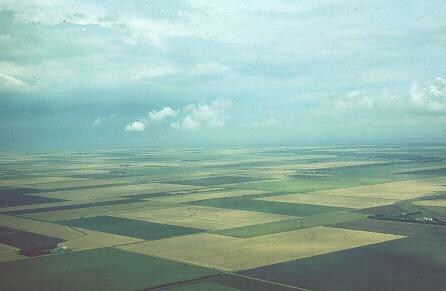 The Red River Valley of North Dakota and Minnesota is a region devoid of mountains and bedrock exposures. Nonetheless, in its own way, the Valley forms a fascinating landscape. The geology can be subtle in appearance, yet startling in its impact. It profoundly affects residents of this region in many ways. We invite you to learn more about the geology of the Fargo region through the resources provided on this and on our related pages. Flooding Along the Red River - Photographs and geologic resources on Red River flooding. Brief Insights on the Geology of Fargo - Why is it so flat here? What holds our cities "up"? Into where do the waters of the Red River flow? Why did "Mount Fargo" begin to sink? Toils on Weak Soils - a History of the Stockwood Fill - Under its own great weight, this massive railroad grade east of Fargo-Moorhead began to sink . . .
A Geologist's Perspective on Planning & Management Issues in the Red River Valley - A document outlining challenges of land use planning in an environment prone to flooding and underlain by weak soils. (PDF Format). Slope Instability and Mass Wasting - The weak materials that underlie the Fargo-Moorhead region are highly susceptible to landsliding, particularly near the Red River. Cass County: River Bank Slumping - Cass County's comprehensive site addressing the problems associated with slope stability near rivers. Fargo From Space - A spectacular satellite image of Fargo. The Story of Lake Agassiz - The agricultural richness and the engineering challenges of our region are both tied to the sediments and history of a large glacial lake that once covered our region. An Afternoon Field Trip - The ties between our geologic heritage and our human heritage form the central focus of this 40-mile roundtrip excursion. Links - Links to other earth science resources on the Fargo-Moorhead region. Please e-mail us your comments and suggestions. of the author, and not NDSU. The automated water level is courtesy of Nem Schlecht.